After waiting what seemed like a lifetime, the 2014 NBA draft finally came and went and the Sixers are now probably guaranteed to win the NBA championship for the next 5 years in a row. Get ready for a parade down Broad St around this time next year. Here’s my very convoluted Sixers 2014 NBA Draft recap. In all reality though, last year’s 19 win season is going to seem very ambitious for the 14-15 squad. Heck, 10 games might be tough. This team might break the losing streak record, win a game and then break the record a 2nd time next year. At least last year’s squad started the year with Evan Turner and Spencer Hawes. They’re not going to make you contenders but at least they were players with some NBA experience. As of right now, next year, Thad’s gonna be it. MCW is gonna be pretty high on the tenure list with his 1 Rookie of the Year year under his belt. We’ll be suiting up MCW… wait, lets just go over what happened. So much has happened since the lottery last month. Embiid’s back problems turned out to be minor and he shot up to the #1 pick making Andrew Wiggins look like E.T. Then a week ago, Embiid broke his stinking foot and all hell broke loose. The last week was brutal, full of speculation as to what was going to happen. Wiggins, Parker, Parker, Wiggins; and how far was, apparently injury prone, Embiid going to fall? Well like I said would happen after the lottery, Andrew Wiggins went 1 to the Cavs because you can’t pass on Riggin for Wiggins. Parker then went 2 to the Bucks. 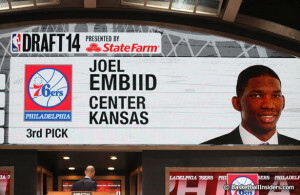 Then, with the 3 pick, the Sixers just couldn’t pass up on the chance to draft “The Dream 2.0”, Joel Embiid. When you watch Embiid, you can’t help but get excited. His highlight reel puts anyone else in this year’s draft to shame. If he can come back healthy, and stay that way, the Sixers will be contenders. He looks that unbelievably talented. Apparently his back was just a minor injury because the dude has a long way to fall and he fell hard on it. The foot injury on the other hand is scary. Others have had it, others have come back fine, others have not. Big men with foot problems are scary. I’m not so sure Embiid is a typical big man though. Sure, he’s 7’0, but he’s not necessarily big. He’s tall, he’s long, he’s quick as hell for a big. He’s like a gazelle on the floor, definitely not a plodding Shaq. Regardless, there’s a 95% chance he isn’t suiting up for the Sixers next season and he’ll take the Nerlens Noel route. Here’s to health and quick return but we won’t see him until ’15-’16. So the 10 rolls around and this was the most interesting pick leading up to the draft I felt. No idea what could happen and rumors had the Sixers taking anyone and everyone including trading the pick. Picks 4-7 didn’t go in expected order but the expected players fell. Then Stauskas jumps to 8, Vonleh continues to fall and eyelids go up. Then Vonleh goes 9 and none of those 2nd tier players made it to 10 as we hoped. What was Hinkie to do? Well he takes draft board skyrocketer Elfrid Payton of course. I mean why not take another PG who can’t shoot? Everyone’s baffled, MCW has one of the most awkward televised interviews ever and by time everything settles, Payton is on the move. Hinkie is taking heat but he held Payton hostage and the Magic paid the ransom. It was a stellar move in my opinion. Hinkie knew the Magic were high on Payton so he roped them into taking the man he always wanted, Croatian Dario Saric, swapping the players PLUS getting us a 2015 2nd rounder and a 2017 1st rounder. This was tough to swallow at first. We all knew Saric just resigned with some foreign team for 2 years with a 3rd year player option. We won’t see Embiid next year and we won’t see Saric for probably 2. I say probably because Saric has since stated that he isn’t a liar, he will play for the Sixers in the future AND he will talk to his foreign team after the 1st year and see if he can come to play for the Sixers early, perhaps only a year from now. People will be crying about that one for a while though because Doug McBuckets was still available but I’m fine with it. Sure, McDermott was awesome in college but this is the NBA. He can shoot the lights out but he’s gonna be way to specialized to be the 10th overall pick. Instead, we got Dario Saric who is 6’10, long, quick, athletic and could be special. Plus we got a ’15 2nd and the ’17 1st rounder BACK that we wouldn’t have had because we sent that pick away for Andrew freakin Bynum. Oh, but who’s gonna score next year? Who cares who’s gonna score next year, we’re gonna be terrible regardless. You think McDermott is gonna right the ship? No! And even if somehow he was Ray Allen in his prime and the team gelled, if we make the playoffs next season, we lose our 1st round lottery protected pick. Instead, we will keep our ’15 1st rounder and it’s gonna be super high, most likely top 5 again. That’s interesting in it’s own right though cause at the moment, it’s all bigs at the top of the 2015 mock drafts. If nothing changes, which it will, but if nothing changes, we just trade down a few spots, get that 2 guard that we need and stash more assets. Someone tweeted last night a perfect tweet. I’ll paraphrase but it went something like everyone in Philadelphia screams for Ruben Amaro to blow up the Phillies and start from scratch but when the Sixers blow it up and start from scratch, everyone just freaks out. C’mon now. C’mon now. It makes total sense people. If there ever was a league built for blowing it up entirely and building it back up again, it would be the NBA. Rebuilding from scratch isn’t a 1 year thing. Sure next year won’t be as fun to watch as the MCW, Stauskas, Wiggins, Thad, Noel that could have happened in an alternate universe but it could be better in the long run. In the long run, we’ll have options. If all 3 pan out, even if Embiid can’t go all the time, we’ll have Saric, Noel, Embiid. We can play small? with the first two or play big with the latter two. We can put them all on the court at the 3,4 and 5 and just make the entire court disappear. We’ll have some depth. MCW improves his shot at the 1, we go find someone who can shoot at the 2 and now we’re talking. We’ll have tons of cap space. Some legit FAs might wanna come to Philly to win some championships. Perhaps an Andrew Wiggins after his rookie contract? I just hope he has a press conference on ESPN and then choses the Sixers. And maybe none of this comes to pass. Maybe it’s all for naught and Sam Hinkie blew it all. All I know is losing in the first round of the playoffs each year was worthless and maybe no one watches the Sixers next year but we can still love them and hope for a brighter future. Watching the same teams win all the time gets old. Let’s get the Sixers back on the map. Phew. This was a long one. I’m not proofreading it. I apologize for the typos, unfinished thoughts and frantic ramblings. I can’t read or write.